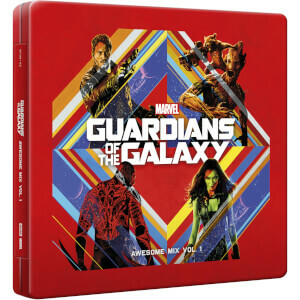 There is embossing on the front of the steelbook . Set to the all-new sonic backdrop of Awesome Mixtape #2, Marvel Studios’ presents Guardians of the Galaxy Vol. 2! Featuring a stunning soundtrack full of retro hits, Guardians of the Galaxy’s Vol. 2 iconic soundtrack is a huge part of the movie itself- and now you can own it in a stunning CD Steelbook. Fully embossed on the logo, you don’t want this soundtrack missing from your shelf. What's not to love? Great music from a great film! I bought this and the 1st sound track, the tins look amazing anf they inspired me to make my first cd purchase in over 20 years!